Gettin' Fresh, a new food truck serving West Michigan, will be celebrating its grand opening with brunch service on May 3 at the White Flame Brewing Co. in Hudsonville, and will be a regular part of Movies in the Park downtown this summer. Gettin’ Fresh, West Michigan’s newest food truck, will be joining some regular hot spots for food trucks in the Grand Rapids area, like the Grand Rapids Art Museum (GRAM) and Ah-Nab-Awen park. They are making plans to be found outside the Grand Rapids Art Museum one Saturday a month, and will be serving dinner fare at Movies in the Park in Ah-Nab-Awen Park the following nights this summer: June 5, June 19, July 10, July 24, August 7 and August 21. 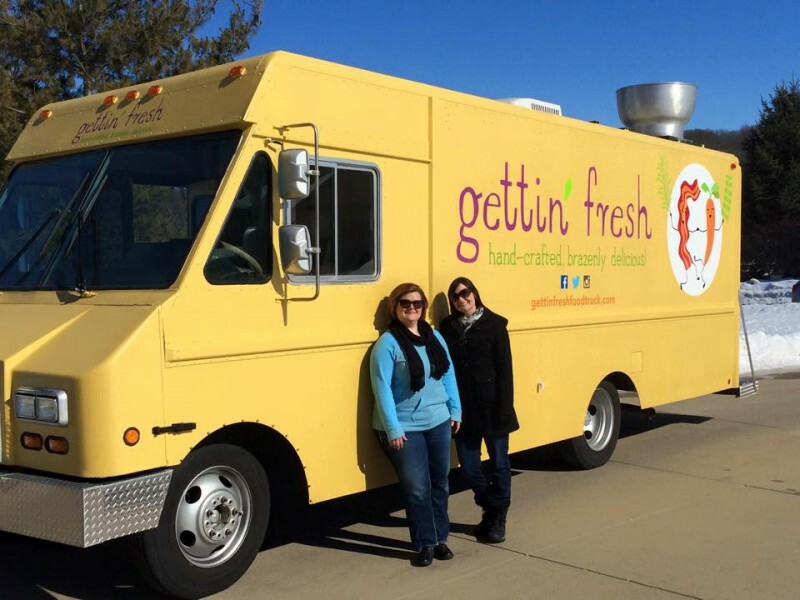 Emily Kelly and Abbie Sterling, co-owners of Gettin' Fresh food truck, are preparing now for a May unveiling, with a launch at the White Flame Brewing Co. in Hudsonville on Sunday, May 3. From 9:30 a.m. to 2 p.m. every Sunday through October, the co-owners and long-time friends be open for business and serving brunch at The White Flame. Focusing on fresh, locally sourced ingredients, Kelly and Sterling say that their goal is, “to develop brunch, lunch, and dinner options that are hand-crafted, healthy, and delicious.” The Hill Sweet Blues blueberry pancakes, Farro Fawcett kale salad and Patty Shacks smoked meatloaf sliders are just a few of the treats customers can expect. “Our motto: Two friends, one truck, good eats- really sums up what we’re all about,” says Sterling. To find Gettin’ Fresh at an area event or to get more details about the menu, visit gettinfreshfoodtruck.com, Facebook, or Twitter. Disclosure: The author of this article is related to Gettin' Fresh co-owner Abbie Sterling and is friends with co-owner Emily Kelly.